If nothing else, the 2016 election has already proven to be a year of firsts. For the first time in America, a self-proclaimed socialist ran a wildly popular American presidential race. In another historic moment, a former first lady became the first female presidential nominee of a major political party. On Tuesday night, another, more implicit, historic event took place as well. 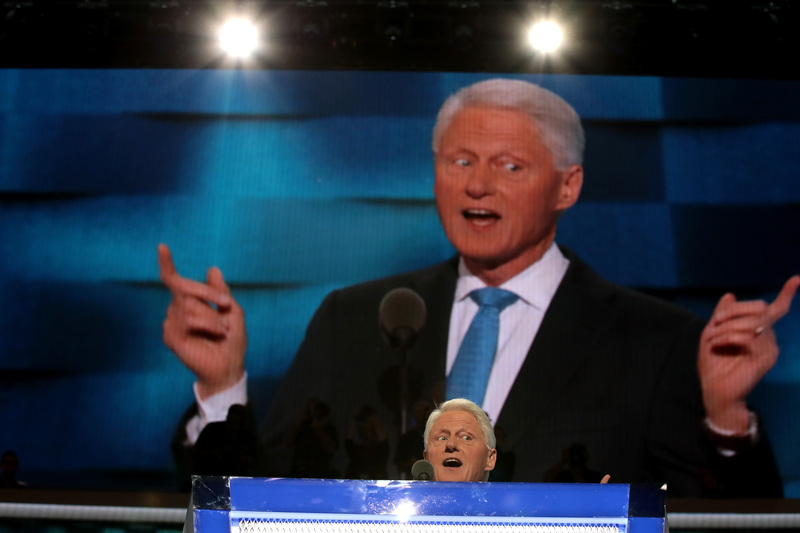 It shouldn't go unnoticed that Bill Clinton making the case for Hillary during his Democratic National Convention speech was the first moment of its kind. A former president promoting his wife's own intentions of filling that top spot is certainly groundbreaking. And hopefully, this won't be the only time. One needn't be a Hillary supporter to take in the exciting and historic nature of this accomplishment, which marks a step forward for the representation of women in American government and leadership positions. It's amazing that it took this long not only for a woman to become a major party's presidential nominee (though, of course, she came close in 2008), but also to listen to her husband give a way-too-long speech about how excited he is to know her, to love her, and to stand by her side while she runs for president. It wasn't just sweet — it was incredible to watch. During what some have called a "long, rambling, strangely compelling" speech, Bill made the audience feel as though they knew Hillary. Through a mix of his natural charisma and aw-shucks knee-slapping delivery, he took the audience through a journey that started in the 1970s at Yale and ended on that very night. The Democratic nominee's husband delivered a message that had all the affection of a long-winded great-uncle who never stops telling his dinner party guests about how successful and amazing his great-niece is. In other words, the former president sounded genuinely proud of his wife and her accomplishments. That was the speech so many of us wanted from Bill, and that was the speech he gave. Time will go on, the election will hurdle up to our doorsteps, and we will forget the majority of the speeches made on the campaign trail until someone reminds us of them four or eight years from now. For example, did anyone else seriously forget about Michelle Obama's 2008 DNC speech until last week? The contents of Bill's speech may be forgotten, but the fact that it was given, and the context in which it was given, will go down in history books.